The Hoof Blog will be closed for the rest of the year while we try to recreate the scene in this beautiful old photo. Maybe it's my proximity to New Hampshire and all the US Presidential election publicity here, but I've taken a keen interest in the American Farrier's Associations elections this year and have compiled some of the minutiae about the candidates. A new system of government goes in place in February when New York farrier Andrew Elsbree takes office as president over a smaller board of regional directors instead of representatives of individual chapter associations of farriers. Two former AFA presidents, Bruce Daniels of New Jersey and Walt Taylor of New Mexico, are candidates for the new board. In fact, most of the candidates are former officers, committee chairs, or chapter presidents. Commercial interests are heavy in the elections; two candidates are technical reps for manufacturers and another has his own line of tools. At least three of the candidates are (or at least have been) commercial clinicians for a horseshoe distributor. What's oddly missing is the competition constituency, although Jason Harmeson was recently on the American Farriers Team and several candidates mentioned their competition experience as helpful to their professional development. Of the 28 candidates, 21 hold the AFA's journeyman certification and only one is not certified. AFA elections are always interesting. In the candidate statements, each candidate provided a photo. Three posed with horses. Two posed with their dogs. Seven sent in photos of themselves in a work setting or anvil-side pose. Two donned neckties. Nine chose to be photographed wearing ball caps; two preferred stetsons. One was excluded from the montage of candidates on the front cover of the election guide. The only two bearded candidates are from New England. One thing they all have in common: they are all men. And they all want the job. The American Quarter Horse Association (AQHA) has been working with the American Farrier's Association (AFA) lately; the two organizations have an educational partnership exchange. To that end, the December issue of America's Horse, the AQHA's promotional magazine, has an article about the conduct of an AFA Certification Testing Day in Oklahoma earlier this year. I highly recommend that anyone who reads this blog find a copy of that magazine (it's not posted online, I checked) and read it. Pay particular attention to the last page, which shows a finished shod foot as presented to the examiner, who then reviews the clinches and explains what is wrong or right with each. If you know anything about nailing horseshoes, it's interesting to see if you saw what the examiner saw. My guess is that the nailing shown, imperfect though it may have looked to the examiner's eyes, is of a higher standard than most readers of that magazine would normally see. They might miss the whole point. What I did find on the AQHA site was a poll of site visitors on the types of shoes their horses wear. 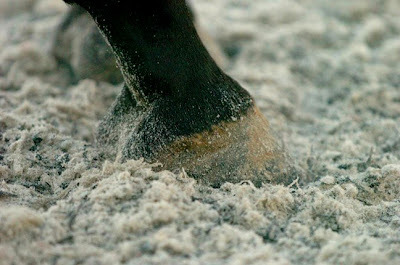 Barefoot was given as a choice, of course, but with the comment "barefoot is better" embedded in the survey question; roughly one-third of the site visitors agreed and said their horses were not shod. If that percentage is indicative of Quarter horse owners in America, then one-third will really disconnect from the AFA's nailing critique in the magazine. More interesting, though, is that the AQHA listed Natural Balance as a separate category of shoes (bar/therapeutic? normal? sliders? Natural Balance?) To me, Natural Balance is a "normal" shoe. I wonder how many owners are truly conscious that their horses wear Natural Balance shoes. Apparently five percent of the total is savvy to their brand name shoes, but the actual total might be higher. There are also Natural Balance lookalike shoes sold, and regular shoes can be re-shaped that way. And just to confuse matters, a horse could be shod with sliders made by Natural Balance or therapeutic shoes based on the Natural Balance pattern, as well! Hoof boots were not listed as a choice. 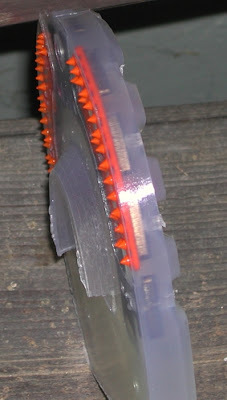 I've just heard about a sliding plate hoof boot that is coming to market; that should be interesting! The poll is ongoing; check it out here. Results showed that only roughly 52 percent of the total horses were shod with normal shoes; 32 percent were barefoot, 5 percent wore Natural Balance, 7 percent had sliding plates, and 4 percent wore therapeutic or bar shoes. Thanks to the AQHA for the educational initiative. It's a jungle out here, isn't it? A meeting in Dallas in September, jointly hosted by American Quarter Horse Association (AQHA) and National Snaffle Bit Association (NSBA), invited the top 100 riders from NSBA, the top 10 riders from open Western Pleasure at AQHA’s World Championship Show from the past three years and a team of judges who specialize in western pleasure. They took the classes apart and looked at the equitation, the judging rules and especially the gaits and movement and speed of the horses in the ring. A special sub-committee is now working on a video to educate the entire industry on the specifics of Western Pleasure horse movement. * Placing more emphasis on judging the walk and using the video to educate exhibitors on improving the walk. * Finding a balance for the amount of time spent judging the jog and the moderate extension of the jog. * Educating rank-in-file members and beginning western pleasure competitors on the positive and negative characteristics of western pleasure horses, and on how the discipline continues to improve. * Additional education for judges and continuing to push for and establish industry standards. * Varying the gait calls to make it more interesting for horses, exhibitors and spectators. As far as I know, this is the first time that the head-bobbing lope has been mentioned by Western Pleasure officials. What they describe as "manmade gaits" will confuse readers who are not familiar with this type of showing. How a horse can win a blue ribbon for a head-bobbing lope is something that takes a bit of getting used to, and video will be the best way to get the message across, surely. For the uninitiated, this sport also has a unique training phenomenon called the "spur stop" or even rating the horse by leg pressure so that the reins don't have to be shortened. Western pleasure survived the "peanut roller" controversy a decade or so ago and the classes only grew larger, so surely this latest revamp will also move things forward and improve the well-being of these horses. 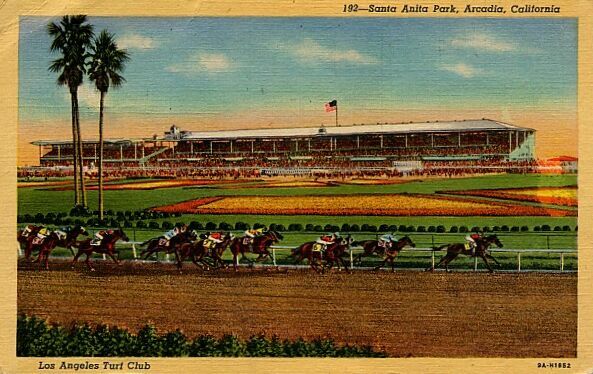 Santa Anita Park in Arcadia, California will open for its winter race meet today. The track opened its one-mile oval main track for training on Saturday, after having been closed for additional repairs since December 3rd. Workers labored around the clock to adjust the new synthetic surface. Rainy weather complicated repairs. Cushion Track, installed over the summer at a cost of more than $10 million, is comprised of silica sand mixed with synthetic fibers, elastic fiber and shredded rubber. The material is coated with a blend of wax. “Our original Cushion Track surface simply was not draining properly,” said Santa Anita President Ron Charles. “Even though it’s not draining to specifications, it has improved and we’re hoping that will remain so. This project has taken longer than we originally intended and we know this has inconvenienced everyone, but the main thing is that we had to address these issues now, in advance of the winter rains that we do expect." The Cushion Track surface was well-received by jockeys, trainers and horsemen during the recent Oak Tree meet, which concluded on November 4. Cushion Track proved that it was a sound and consistent surface, after withstanding summer temperatures that at times exceeded 100 degrees. However, due to continued concerns about drainage, Santa Anita has solicited numerous track surface and soil preparation specialists, who have conducted a number of maintenance programs on the main track and water tests in the seven furlong chute. These experts all agreed that it would be advisable to conduct further investigative efforts on the Cushion Track and its drainage foundation before the Santa Anita meet begins today. Although the same major components—silica sand, synthetic fibers, elastic fiber and granulated rubber and wax are present in every Cushion Track surface, the combination of these elements is custom designed to meet the weather conditions at each track. So too is the size, porosity and composition of the underlying rock layers that cover the miles of drainage pipes that have been installed. In addition to remixing the Cushion Track material, workmen had to address the two-inch thick blacktop underpinning of the track as well. “Due to the fact we had far too much fine sand in the original mixture, a lot of that material had coated and effectively sealed the blacktop, which is designed to be porous. It was quite a job, but we’ve got the blacktop cleaned and draining well,” said Charles. Horsemen based at Santa Anita have had to work their stock either on Santa Anita’s six-furlong dirt training track, or ship across Los Angeles to Inglewood to use Hollywood Park’s Cushion Track. The traditional opening day feature is the Grade I Malibu Stakes for 3-year-olds at seven furlongs; the race attracted a full field of 14. Ninety-nine horses are entered in races at the beautiful racecourse today. Santa Anita will host the 2008 Breeders Cup on Friday and Saturday, October 24 and 25, 2008. It will be the first Breeders Cup run on an artificial surface instead aof dirt. Note: Information for this post was supplied by Santa Anita as part of Hoofcare and Lameness Journal's ongoing efforts to report on new surfaces used for equestrian sports and racing and how they may impact equine safety and soundness. Is That a Starfish Atop Your Holiday Tree? Thanks to my friend Ellen Harvey of Harness Racing Communications, a project of the US Trotting Association, for reminding me of a great parable that is so symbolic of the renewal and reflection that should mark our days over this holiday break. Ellen occasionally drives out to the New Holland (Pennsylvania) horse sale where she methodically buys a few youngish Standardbreds. She and a few investors fund rehab and retraining on a couple of ex-racehorses a year until they are ready to go to homes as pleasure horses. When one is placed in a home, they go get another. Ellen's efforts save the equivalent of a very small drop in the bound-for-slaughter bucket. She calls her project "Starfish Stable" and there's a good story behind the name. 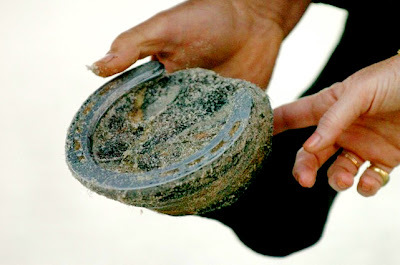 A young man was picking up objects off the beach and tossing them out into the sea. A second man approached him, and saw that the objects were starfish. 'If the starfish are still on the beach when the tide goes out and the sun rises high in the sky, they will die,' replied the young man. 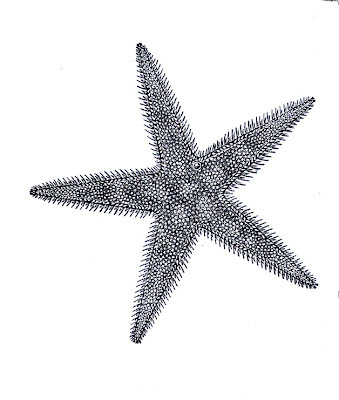 Sometimes starfish have four hooves and a mane and a tail. Starfish aren't just at the killer auctions. They abound in the hoof world, and they are all around us. They're the foundered horses you brought home when the owners gave up. They're alive and well in those bills that you "forgot" to send out, or the ones where you dropped a zero off the total. There are starfish among the kids you let follow you around. That 28-year-old Cushings horse with laminitis who can now trot in his new booties proves that you're never too old to be a starfish. Maybe we can't save all the foundered horses in the world, or prevent every racehorse from breaking down or fund all the research that needs to be done. But each of us can--and, I believe, based on what I see, does--help make a difference by helping out a few starfish now and then. Looking down this long, long beach, I hear splashes, all year long. Merry Christmas to all the lucky starfish in the sea and to all of you. Cheers! 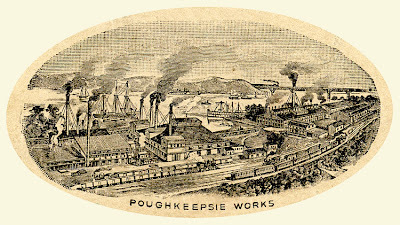 Somewhere in this engraving of the Phoenix horseshoe mill in Poughkeepsie, New York is the little house where "The Night Before Christmas" is believed to have been written. Double-click on the image to see an enlarged view. Do your holiday plans include reading or reciting "The Night Before Christmas", also known as "A Visit from St. Nick"? It may well be the best-known bit of poetry ever written in America. But did you know that there's a horseshoe connection to the poem? The poem is believed to have been written by a Poughkeepsie, New York gentleman, Henry Livingston, who read it to his children. After his death, the poem was published in a Troy, New York newspaper and attributed to the poet Clement Clark Moore. The Livingston family has been fighting for the poem to be credited properly to their ancestor, but it has been hard to prove. One tidbit from their family web site is that the reindeer names may actually have been the names of Henry Livingston’s horses. After Henry's death, the Livingston family’s home became the headquarters office of the fledgling Phoenix Horseshoe Company, whose massive factories soon lined the shore of the Hudson River. Phoenix and the Troy-based Burden Horse Shoes, an hour further up the Hudson River, dominated the horseshoe manufacturing world up until the World War II era. Isn't it odd that the two leading cities of horseshoe manufacturing would also be the two cities of the Christmas poem's controversy? After the turn of the century, Phoenix tore Henry Livingston's house down, but horseshoe moguls obviously believed in Henry's authorship of the poem. Phoenix carefully removed and donated the mantle and hearth, such a vivid setting for St. Nicholas in the poem, to the Daughters of the American Revolution’s Poughkeepsie chapter. It is supposed to be in the Clinton museum there. I'd say that if the business of Phoenix Horse Shoes was conducted before that hearth, it is doubly of interest and worth knowing its whereabouts! Wait, there’s more. While there is no written history of Phoenix that I can find, there do seem to be ongoing ties between the Livingston family and the fledgling farrier industry of the 19th century. The Livingston Horse Nail Company, headed by S. Otis Livingston, had an agent who also represented Phoenix. The Livingstons made rasps and aprons, as well as Livingston, Anchor, New Haven and Coleman brand nails. Henry Livingston was involved as an investor--or more like a modern-day venture capitalist/equity trader--in the Forge Village and Globe horse nail companies in Massachusetts. 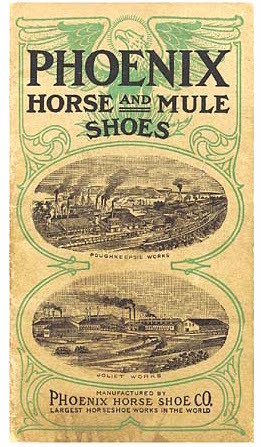 According to an ad in the 1907 Horseshoers Journal, the company was founded in 1845, predating Capewell. 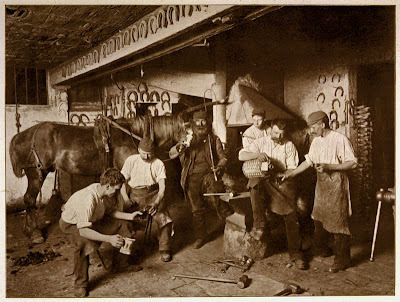 At that time, farriers were sold "horse nail iron" from Norway, which they used to make their nails. Early manufactured nails were sold unpointed, especially from some of the firms that Henry Livingston invested in. The Livingstons were an influential political family and a very wealthy one. They helped write and then signed both the Declaration of Independence and the United States Constitution. It was a Livingston who swore George Washington into office for his first term. U.S. Presidents George H.W. and George W. Bush are direct descendants of the Livingstons of Poughkeepsie. I know if I dig deeper (or someone in Poughkeepsie does it for me) I will find a more direct link between the Livingstons and ownership or backing of the Phoenix Horse Shoe Company. Then, this really will be the night before horseshoes. But for now, let’s pretend that Henry Livingston was frustrated because his horses all needed sharp winter shoes to get around the icy December roads of Poughkeepsie. He imagined they could fly, all hooked to a sleigh. Perhaps his farrier gave him an idea, too! Merry Christmas…and to all, a good night! 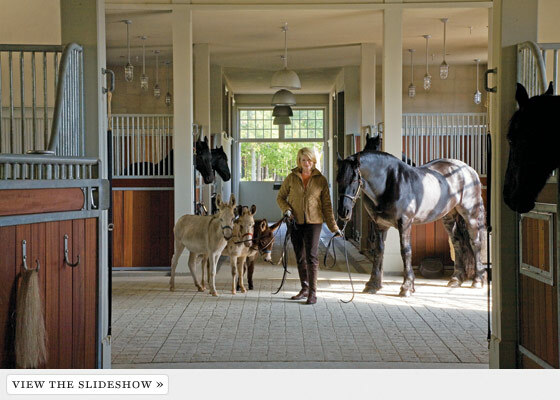 Kudos to stylemaker/domestic diva/media mogul Martha Stewart for a photo feature on her blog today that salutes her farrier, Hoofcare and Lameness subscriber Linda Friedman, who cares for the hooves of Martha Stewart's Friesian horses at her new farm outside New York City. Click here to view Martha Stewart blog story about farrier Linda Friedman. Congratulations to Linda for the relationship she has developed with Ms. Stewart. Linda is a caring professional whose client list includes some very high-profile horses and horseowners. She is a great ambassador for the farrier profession who excels in caring about the safety and well-being of the horses in her care. I enjoyed seeing Linda at the recent laminitis conference in Florida. Linda is always diligent about continuing her professional educational development and she said she really enjoyed the half-day masterclass on warmblood shoeing with Dutch farrier Rob Renirie in Florida. Among Linda's clients are Mr. and Mrs. John Castle, that conference's "angel" benefactors. I wonder what the interview process was like to be selected as Martha Stewart's farrier! And notice the lovely white beadboard paneling (and heating ducts) in the barn aisle...lots more photos of Linda and the barn are on Martha's blog! Here's a wider view of the barn aisle, from an article about the stable in New York magazine. Click here for a little show with more images of the stable interior and artisan design fencing. News out of Canada today is that all is not well at Nova Scotia's Horsepower Hotel. Owner Edwin Cameron, who is described on a tourism web site as the largest private farmland owner in Nova Scotia and operator of a bison farm, was the American Quarter Horse Association's 2006 World Pole Bending Champion. Cameron is suing the manufacturer of his hyperbaeric oxygen chamber, which he says contained a design flaw that caused it to explode, killing four barrel horses that were undergoing treatment inside the unit at the time. Earlier, Cameron's top horse, 2005 amateur and senior pole bending world champion, The Money Merger, had broken a leg and was euthanised shortly before the Quarter Horse Congress and AQHA World Show; then the chamber disaster wiped out his other horses. He bought horses with enough points from other riders and showed anyway, winning two world championships at the World Show. His wife's horse was killed in a fire around the same time, according to a story about Cameron on the AQHA web site. It's not clear why Cameron was treating his horses with oxygen therapy, which is commonly used for horses with burns or other wounds, or laminitis. It is also used by human athletes for conditioning and in particular by deep-sea divers suffering from decompression ills. Speakers from both the University of Tennessee's equine research program and Kentucky's Hagyard Equine Medical Institute detailed their treatment of laminitis with oxygen chambers at the recent laminitis conference in West Palm Beach, Florida. A chamber is in use at Winstar Farm and at Keswick Equine Therapy Center, both in Lexington, Kentucky, at Coolmore's training facility in Ireland and at Alamo Pintado Equine Hospital in the Santa Ynez Valley of California. Sympathies to Cameron and his family over the loss of their horses. The accident wasn't publicized when it happened. I'll try to keep you posted on the progress of the trial. Why Don't Penguins' (and Horses') Feet Freeze? 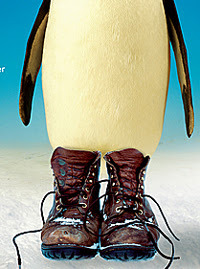 One of the most popular gift books for Christmas is “Why Don’t Penguins’ Feet Freeze?” It’s been at the top of the nonfiction bestseller list in Great Britain and you can find it over here, too. The book is a collection of "Last Word" back-page essays from one of my favorite magazines, New Scientist. The catchy title is an easy question to answer for most Hoofcare and Lameness Journal readers, who have read the research of Dr. Chris Pollitt or been to his lectures, like at the recent 4th International Equine Conference on Laminitis and Diseases of the Foot. I never thought the day would come when arteriovenous anastomosis shunts would roll off my tongue, but the day is here. By next year, I hope to get the spelling right! AVA shunts change the direction of blood flow to aid in cooling or warming the extremities; Dr Pollitt’s video, “Horse Foot Studies” shows the fine blood supply of a rabbit’s ear and how it contains tiny shunts that prevent the bunny ears from freezing on cold nights like tonight. If you want to learn more about penguins and how they survive in Antartica, the web site "Cool Antarctica" has a very wonderful web page about their thermoregulation. They make a point about penguins that is also true for horses: the muscles that control the feet are closer to the heart and mostly within the warmer body of the horse. Only the tendons and ligaments run down the limb; technically, the motors that control the rubber-band-like tendons that flex the foot are warm and wired. Back to the gift book: you can pat yourself on the back for knowing the answer to the title question but there’s another one that bothers me: Why doesn’t super glue stick to the inside of the tube? Maybe I’ll have to buy the book after all! One study indicated that supplemental dietary Omega 3 fatty acids reduced inflammation in younger horses that could become race or show horses, said Drs. Pete Gibbs and Brett Scott, both Texas Cooperative Extension horse specialists. The other showed that Omega 3 reduced inflammation in the joints of older horses. It has long been thought that Omega 3 fatty acids could help reduce joint inflammation in mammals, Gibbs said. Other mammals, such as dogs, have had a tremendous response to supplemental Omega 3 fatty acids, Scott added. The studies was completed as part of Trinette Ross’s and Denise Manhart’s master of science degrees. Animal science and medical researchers collaborated in the studies. For Ross's study, nine yearlings were separated by gender and age. The horses were given one of three dietary treatments containing varying amounts of Omega 6 and Omega 3 fatty acids. Blood samples were taken periodically to measure inflammation. The indicators of inflammatory response were lowest in horses fed naturally occurring Omega 3’s found in mechanically-extracted soybean oil, Gibbs said. For Manhart's study, 16 mature horses with arthritis in the leg and foot joints were grouped by the severity of arthritis, affected joints and age, and then randomly divided into two groups. Both groups were given the same feed for 90 days, but one group was given supplemental Omega 3 fatty acids daily. Blood samples and synovial (joint) fluid were collected at periodic intervals, Gibbs said. Horses that were fed the supplement Omega 3 fatty acids had lower synovial fluid white blood cell counts than those in the control group. Arthritic horses will typically have a much higher number of white blood cells than non-arthritic horses, Scott said. However, horse owners don’t necessarily need to rush out and buy their horses Omega 3 supplements. Both specialists recommend calculated and balanced Omega 3 fatty acid supplementation for performance horses. However, most old horses kept for recreation are generally not very active. These horses have many dietary considerations. Scott said, “Further research is needed to determine if arthritic horses will have increased mobility” as a result of this feeding supplement. And now for something completely silly! 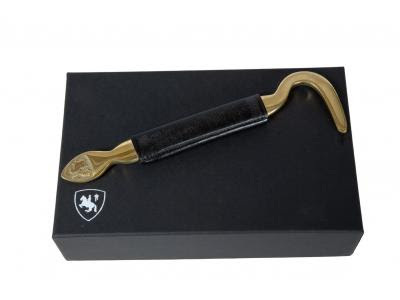 If my last gift suggestion--a $60 hoof pick--didn't fit your Christmas budget, fear not. Here's the next one, and it's 100% free! As long as you have a few minutes free to noodle around on your computer, of course. All you need is a digital photo (low resolution, no larger than 2 MB) of yourself, your family members, your co-workers, you clients, your horses--whatever you pick. It can be one photo or a half dozen. Decide if you are feeling in an upbeat "elf" mood or a grumpy "scrooge" mood. Go to http://www.elfyourself.com/ or http://www.scroogeyourself.com/ and just follow the directions--upload your photo(s) (one by one), reduce or enlarge the face, rotate the face, frame the face and then enter some email addresses, or your own, to see what you've just done. Quite a few people have sent me themselves as elves, no one has sent a scrooge yet! The elves all look really different and the horses, dogs, and cats that some people (you know who you are)elved worked out great, too! At first I thought this was really dumb but I couldn't help laughing! Hint: you should end up with a silly chorus line, if you uploaded a group of photos, or a solo singing and dancing elf, who looks a lot like you, if you only uploaded one photo. Go ahead, make someone laugh--even if it's only yourself! This little trick is sponsored by officemax.com, who report: More than 65 million ElfYourself.com visitors have created more than 41 million elves to date since the site launched in mid-November. On average, 35 elves are being created per second! And when you've mastered that, you can move up to http://www.reindeerarmwrestling.com! It's Sunday night now, and this has been a lost weekend. On Friday night, a fire broke out two blocks from Hoofcare and Lameness World Headquarters. An apartment house and the local synogogue were lost, and one gentle sole died, despite valiant rescue efforts to get him out. 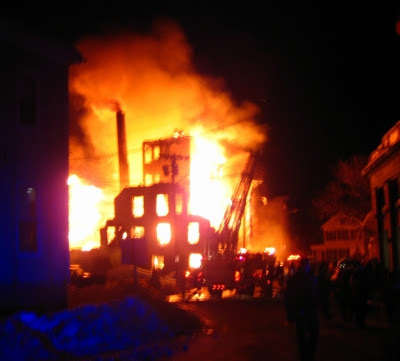 It was a raging inferno, eight alarms, with almost every town north and east of Boston responding. Down here on the harbor, big chunks of debris flew through the air, carried like fireworks sparks by a stiff wind. They landed in evergreen trees, glistened in flower boxes, sizzled in an open dumpster. Most of them skittered across the snow and into the ocean. Luckily, we had a snowstorm on Thursday, so the roof was covered in snow. The fire was still burning today, even though it snowed all night last night. The whole town, and this building, are veiled with smoke. The sky's a strange color. We all have sore throats. It was a fire that could have easily destroyed the town, and this office with it. Thanks to the hard work of professional firefighters who went to work and did what they know how to do, and thanks to a mild evening with just a normal wind, a worse disaster was averted. 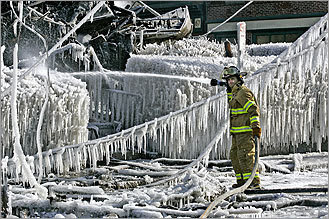 This fire, like so many, was caused by human error and carelessness, compounded by the vulnerability of an old building. Tragedies never have to happen, but they do. At the US Eventing Association Annual Convention in Colorado last week, the Christine E. Stafford Eventing Groom of the Year Award went to Jeff Beshear, who gallantly grooms for his wife, Emily Mastervich Beshear of Brickland Farm of Somerset, Virginia. Jeff, who is a native of Lexington, Kentucky, probably does a lot more than just groom the horses. If his name rings a bell, it is because he is a partner in the Old Dominion Equine Associates in Keswick, near Charlottesville, Virginia. He completed his veterinary studies in 2000 at the Ohio State University; his specialized interests include sport horse lameness with an emphasis on diagnostic imaging, and also equine reproduction. He is an avid foxhunter and shares his wife's passion for eventing. Congratulations to Jeff! Now, can you show me how you do that little pattern thingy on the rump for the trot-up? After you've injected his hocks, of course. I can't think of a handier or more cost-effective groom than a lameness-specialist vet! But can he braid? Also, at the USEA convention, Horse of the Year honors went to Theodore O'Connor, the twelve-year-old, 14.2-hand Thoroughbred/Arab/Shetland gelding (Witty Boy—Chelsea's Melody) owned by The Theodore O'Connor Syndicate, LLC. With three-time Olympian Karen O'Connor in the irons, the talented pony tallied several wins this year, including individual and team gold medal at the Pan American Games in Rio de Janiero. They also won The Fork CIC3* in April and were third at the Rolex Kentucky CCI4*. JUST FOR FUN: Enjoy some late night antics in the biomechanics lab by a wannabe freestyle horse trying out some new moves! Turn up the volume and click on the triangle/arrow "play" icon. The original animation was by Eddy Boxerman, a computer sci masters candidate at the University of British Columbia, now living in Montreal. Some unknown Aussie put it to music. This might not work on a dial-up connection, sorry! Follow the link to Eddy's page for some normal gallop frames for comparison; they are .mpg files and might play on your system if the youtube one doesn't...but there's no music. To Give and To Get: Every Dressage Rider's Favorite Present! What's next on our gift guide? There is always someone on your list who is one of those people who has two of everything. If he or she has an interest in dressage, baroque breeds, or European history , Dover Saddlery has just the thing: something he or she doesn't have yet (probably). Yes, it's over the top, but the finely crafted Spanish Riding School hoof pick comes in a beautiful box and makes a super gift for someone who is equally over the top. The cost? About $70. Hopefully it will go in the trophy case and never touch a hoof! It would look great mounted on a plaque for an award, too, the next time you sponsor a class at a horse show! Double-click on the illustration to enlarge it in a new window. This is a great and simple guide to hind leg action caused by various conditions. The year-end report from the Morris Animal Foundation reached me today, and I will be passing along a couple of nuggets from MAF-funded research that I think might be of interest to blog readers. This one, in particular piqued my curiosity. Anyone who works around big horses will soon run into a shiverer and there has long been speculation that, since many also suffer from equine polysaccharide storage myopathy (PPSM), many thought that some link must exist between the two. A shiverer is a horse with a gait and stance problem characterized by compulsive hyperflexing and trembling of the hind leg. Farriers are often the first to identify a shiverer, which becomes a chronic condition and sometimes causes lameness. Shivers is a devastating disorder in draft and warmblood horses whereby horses develop muscle tremors and hyperflexion beyond normal limits of the rear limbs during shoeing, after standing still or when backing up. Many affected horses also show concurrent tail tremors. In some horses, Shivers never progresses, while in others it leads to weakness, muscle atrophy and an inability to get up that may require euthanasia. The investigators examined whether Shivers is caused by another painful muscle disorder, equine polysaccharide storage myopathy (PPSM), or whether PPSM and Shivers are common but separate disorders that can coexist in the same horse. Dr. Valberg's report: "There is a high prevalence of both PSSM and Shivers within the Belgian draft horse population. "Researchers discovered that 36 percent of Belgians in the study suffered from PSSM and the same disease was found in warmblood horses. "The most common signs of the disease were unexplained lameness, reluctance to engage the hindquarters and muscle stiffness during exercise. "The team also identified Shivers in 20 percent of Belgian draft horses. This disease causes horses to have trouble backing up because their hind legs become fixed in an elevated, flexed position. "Researchers learned that contrary to what was previously thought, Shivers is not caused by PSSM." There's no mention in the report of how many, if any, horses in the study suffered from both PSSM and shivers. To learn more: Hoofcare and Lameness published a detailed article on PSSM and how it manifests as hind-end lameness in horses in our issue #75. Our author Beth Valentine DVM PhD of Oregon State University College of Veterinary Medicine is a specialist in PSSM and an early investigator of the disease. She carefully differentiated how draft horses display hind end lameness, explaining the hind leg motion of shivers, stringhalt, patellar problems, and PSSM in an attempt to get more horses treatment for PSSM, which can often be helped with simple dietary changes. The new MAF-funded research motivated me to dig out the old Hoofcare and Lameness article; it is still an excellent paper and makes me wonder about all the horses that people describe to me as shiverers. More bad news from London. The play that gave hoof picks a bad name is coming to New York. Child film star Daniel Radcliffe, a.k.a. Harry Potter, will have the starring role in "Equus", a disturbing production that has nothing to do with the glossy magazine and little to do with horses. Now 18, Radcliffe obviously is out to shake his wizardly stereotype. On stage in Equus, his character tortures horses with a hoof pick, gouging their eyes out, among other misogynist activities. Tack shops in New York should love it. At least the carriage horses in Central Park will be safe from copy-cat criminals. The ASPCA and PETA hope to have a city-wide ban against the carriage trade in place by summer. Interesting, considering that Mayor Bloomberg's daughter, Georgina, is one of the top show jumper riders in the USA. It was revealed this week that Bloomberg (the mayor, not the rider) actually has a horse advisory board. Maybe they could ban the play instead of the real horses. Equestrian Sport Productions, LLC Managing Partner Mark Bellissimo (left) and Olympic footing expert Bart Poels of Belgium (right) surveying Palm Beach International Equestrian Center's Internationale Arena in preparation for installing an all-weather surface. The 124th National Horse Show winds up tomorrow at the Palm Beach Polo Equestrian Club in Wellington, Florida. For years, we have come to associate the Winter Equestrian Festival (WEF), which opens in mid-January, and other events held at Wellington's Palm Beach Polo Club grounds, with carpets of green grass. Green is a foreign color to northern eyes in winter. But all that changes forever on Monday: Heavy equipment is waiting in the wings. The 2008 Olympic Games footing specialist, Belgian Bart Poels, has received the nod to rip up the grass--immediately--and put in an all-weather surface in time for the big shows to start a scant five weeks from now. One grass ring will be preserved. The first major project will be to install an all-weather surface in the Internationale Arena. An area measuring almost 70 by 120 meters (230 by 394 feet) on the side of the arena closest to the Jockey Club will be all-weather. All-weather footing is also scheduled to be installed at the adjacent Stadium facility that is being completely rebuilt to become a major high performance event arena. Poels is also working with HITS/Culpeper (Virginia) on arena footing for 2008, having completed consultation on HITS/Thermal (California) footing for the upcoming west coast shows. Different types of sand that are the primary ingredient of what is known as the "Poels-sand" surface footing were sourced to several quarries in Florida. Mixing the sand and other ingredients has been underway at a site near Wellington since November 27. Over the following two to three weeks, about 4,500 tons of rocks of varying sizes and 2,000 tons of sand will be installed in four layers. In addition to the Hong Kong Olympic arena, the Poels family has installed indoor and outdoor arenas in their native Belgium, Germany, the Netherlands, France, Spain, Austria, Italy, Portugal, United Arab Emirates and Turkey. Individual customers include top riders Francois Mathy, Ludo Philipaerts, Philippe Lejeurne, Mark van Dijck and Henk Nooren. All-weather outdoor arenas have replaced grass at some of the world's top horse shows in recent years because of concerns over the welfare of horses and the difficulties of maintaining grass for longer than the four to six days of a major competition. Among those to have made the switch are Rotterdam and Rome, both of which are in the Samsung Super League Nations Cup series. WEF in 2008 is being expanded to 12 weeks in Wellington, from January 16 through April 6 with record prize money of more than $4.7 million. Wellington Equestrian Partners, LLC, operating as Equestrian Sports Productions (ESP), bought The Show Grounds and The Stadium in September and acquired the U.S. Equestrian Federation Wellington licenses in November to enable it to stage several months of hunter, jumper and dressage shows, including the Winter Equestrian Festival (WEF) in Wellington. A year ago, the WEF was almost delayed or even canceled when an outbreak of Equine Herpes virus (EHV) in December sent the show and polo communities into paralytic quarantine. Check this blog in late January for feedback from the farriers on how cuppy, slippy, trappy, dusty or hopefully perfect the new footing turns out to be. There's a lot riding on that surface, and the horses shipped south with their shoes set up for training and showing on specific surfaces. Many go south with extra shoes already made up from their northern shoers. The expression "horses for courses" applies to show horses as much as to racehorses; certain horses seem to prefer some types of footing, or a certain showground. Some horses excel on grass, while others are "indoor" specialists. Schooling and warmup areas can make a big difference, too. Will the last Jack Russell on the grounds please have a good roll on the grass? The Blood-Horse web site has a good article ("Vote of Confidence for Synthetics") as Ron Mitchell reports from the University of Arizona's Symposium on Racing and Gaming. He compiles comments from a panel of track executives that are now conducting race meets on Polytrack, one of three synthetic track surfaces in use in the USA. New Blood-Horse editor Dan Liebman has a slightly more cautious editorial online, too. The magazine published a special section on synthetic surfaces this week. Polytrack is pursuing the equestrian arena market now, as evidenced by a nice double-page spread ad in Sidelines, the Palm Beach, Florida show/polo magazine. The surface originated in England and American interests are partnered by the Keeneland Association in Kentucky. Photos in this blog post have been enhanced; originals were courtesy of Polytrack. All the eagle-eyed farriers who read this blog will wonder about the shoe in the top photo....maybe it's a stable pony? The Palm Beach Dressage Derby, Inc. will offer a one-day seminar on sport horse biomechanics with Drs. Hilary Clayton and Rob van Nessum on January 19, 2008. Proceeds will benefit the Mary Anne McPhail Equine Performance Center at Michigan State University. The seminar is open to the public. The advanced-registration cost is $85 per person for the entire day and includes a boxed lunch. On-site registration fee is $100. Click here for more details and a link to register online. In all my years in horse journalism, I've never seen anything like this. Not even Burney Chapman, Hiltrud Strasser or Gene Ovnicek has ever received publicity like this. Blog readers will be well-advised to pick up a copy of the December 2007 issue of Horse and Rider magazine. Sit down for a while and read all the way through the eight-page interview with barefoot's de facto spokesman, Pete Ramey. Horse and Rider has been promoting barefoot hoofcare for some time now, and Pete Ramey in particular. I can't think of anyone who doesn't like Pete and I'm delighted for his success. I think the barefoot-shod debate, if you want to call it that is evolving. Pete Ramey and other barefoot leaders endorse new generation hoof boots as "the horseshoes of the 21st century", to quote Pete. I cringe when I hear this. Such a statement places even more of a stigma on traditional horseshoes and a lot of peer pressure on owners from "barn nazis" to pull those evil shoes off a horse. To be successful, the barefoot option has to be more than fashion, and saddling up a lame horse to go riding in hoof boots that may or may not fit is a new form of equine abuse that no one is talking about yet. I'd like to see people like Pete encourage boot use for long rides or rough conditions, not for every day use on a sore-footed horse as an alternative to traditional shoes and certainly not for turnout. A "2 butes + boots = ok to ride" formula is not much of an improvement. I think of barefoot horses as the equine equivalent of hybrid cars: it's not enough just to have a car that saves gas, especially if the rest of your lifestyle includes an energy-guzzling home, boat and RV. Some people buy a hybrid to look cool or to save money for the drive to work in the morning without buying into the bigger commitment of living more lightly on the earth in terms of energy consumption. Hoof boots are cool now. They also hide the hoof they are designed to help and no one but the rider knows what lies beneath or how raw those heel bulbs will be when the boot is finally pulled off. I've seen riders trade boots between horses that didn't have the same size or shape of feet. I've seen people put them on without cleaning them out. I've seen hairless coronets, dangling straps, and boots left on for days on turned-out horses. One of my favorite stories is from years ago when I was at a boarding barn. The Old Macs boots had just come out and a wealthy boarder had bought four, to go all around her sore-footed barefoot horse. The boots seemed to fit and she rode off one afternoon. A sound barefoot horse should always be the goal and I hope that part of Pete's message doesn't get lost. Read this article, it is important. Horse and Rider should be available on most newsstands and in tack shops. Eleanor Green, DVM, DACVIM, DABVP, of Gainesville, Florida, was installed as the 54th president of the American Association of Equine Practitioners during the group’s annual convention in Orlando, Florida on December 4, 2007. She will serve through 2008 and becomes the first female veterinarian to lead the association. With a distinguished career in academia, Dr. Green currently is a professor and chair of the Department of Large Animal Clinical Sciences at the University of Florida College of Veterinary Medicine. She also is the chief of staff of the college’s Large Animal Veterinary Medical Center. Dr. Green previously was a member of the veterinary faculties at Mississippi State University, the University of Missouri and the University of Tennessee and also has experience in private practice. Under Dr. Green's leadership, the University of Florida is actively promoting staff farrier services. The university's web site devotes a page to the bio of staff farrier Mr. Adam Whitehead, who recently attended the Fourth International Equine Conference on Laminitis and Diseases of the Foot in West Palm Beach, Florida and is a Hoofcare and Lameness Journal subscriber. British farrier Gary Darlow of Meadow Bank Farm in Over Peover, Knutsford, England is the first Horse Trust Open Farriery Champion. 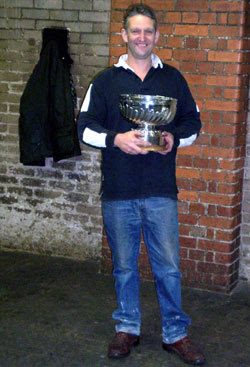 Gary won the award, which included a perpetual rose bowl trophy and a check for £250, in a farriery contest recently at the British Army Farrier School at Melton Mowbray, Leicestershire. Competitors were required to participate in two classes -- Hunter shoeing and Therapeutic shoeing. Points were awarded for each class and Gary was the overall winner. Gary, who treats riding ponies, polo ponies, hunters and Shire horses throughout Cheshire, England, learned the profession in the mid-1970s; he is now 48 years old. He has, he says, been competing ever since. "For the apprentices and other farriers, contests are a fantastic learning curve. I've learned more by competing than from anything else," he says. "You get the best people in the world at competitions and you can learn from watching them. Most of those who compete are very good at what they do but are not recognized for it outside the farrier industry. "Some of these lads, the practicing they do at home is amazing," Gary added. "Some of these shoes are very complicated to make, because there are so many different sorts of shoes and you have to practice them all. You may know before the competition what you will be asked to do, but you have to spend hours beforehand practicing to reach the standard. Competing at horseshoeing is like any other event: if you don’t practice you won't get there." He was thrilled by the letter from The Horse Trust following the awards ceremony. Paul Jepson, chief executive of the Trust, wrote: "I can think of no one who has demonstrated a more consistently high standard of farriery over many years and you are a worthy champion." Note: The Horse Trust was established in 1886 and is the oldest equine charity in the world. They are leading funding source in the UK for research into strangles, sweet itch, ragwort poisoning, colic and laminitis and fund many meetings and horse health initiatives. Over £20 million (approx. $40 million US) has been invested by the Trust in research and education. Wedgewood Pharmacy has introduced peppermint- and alfalfa-flavored Pergolide for Cushngs-affected horses in Gourmeds(TM) dosage form. Gourmeds are chewable, naturally-flavored tablets that are easy to administer -- and tasty as a treat. Gourmeds also is an economical medication form that costs about one-half the price of Pergolide in suspension form. Pergolide mesylate, a drug used to treat Parkinson's disease in humans, was withdrawn voluntarily from the market in March 2007 because it was reported to carry a risk of serious heart-valve damage in humans. Equine veterinarians also prescribe the drug for horses with equine Cushing's Syndrome. The withdrawal of the drug for human use had an unintended but serious side effect in barns, stables and pastures throughout the United States and left equine veterinarians scrambling for an alternative -- and legal -- source of this critical medicine. Under the Animal Medicinal Drug Use Clarification Act of 1994, veterinarians are permitted to prescribe drugs intended for human use in "extra-label" uses in animals. According to the FDA's Center for Veterinary Medicine (CVM), compounding pergolide from bulk substances for animal use is permitted in response to a valid veterinary prescription to treat an affected horse. The FDA was sufficiently concerned about the market withdrawal of pergolide that it announced that it will "work with sponsors interested in seeking approval of a new animal drug application for the use of pergolide to treat Cushing's Syndrome in horses," according to Wedgewood. Gourmeds are now available to veterinarians in the United States. 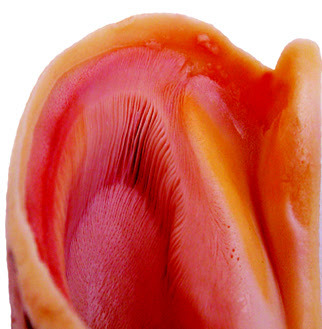 Quite a View: Fetal Feet from New Book "Hoof Problems"
Here's one of my favorite images from the new book "Hoof Problems". Do you have your copy yet? We sold out at Cornell vet school's farrier conference but have plenty more in stock now! Dr. Dyson specializes in sport horses at a leading diagnostic referral clinic in England. Sue Dyson MA, VetMB, PhD, DEO, FRCVS, Head of Clinical Orthopaedics at the Animal Health Trust equine unit in Newmarket, England will present an in-depth three hour presentation on Tuesday, December 4 at the American Association of Equine Practitioners Convention at the Orange County Convention Center in Orlando, Florida. Co-presenting with Dr. Dyson will be Kent Allen DVM of Virginia Equine Imaging. The title of the program is “Lameness and Diagnostic Image in the Sports Horse: Recent Advances Related to the Digit” and it will be a case-by-case presentation between the two experts. 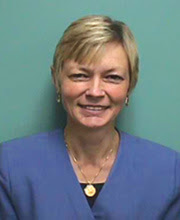 Dr. Dyson is known in the foot world for her meticulous diagnostic procedures and her documentation of imaging techniques, particularly in the foot. In recent years, she has made tremendous strides by using Scintigraphy and MRI to confirm or debunk the diagnosis of navicular disease in certain horses. Her article in Hoofcare and Lameness #79 documented lesions in the deep digital flexor tendon that were treatable with rest and therapy. Many “navicular” horses have been re-evaluated since MRI has been in use, thanks to Dr. Dyson’s documentation. The tendon tear findings also explain why some horses appear to recover from navicular disease after being turned out to pasture and why other horses may not respond to certain types of medications. Click here to download a PDF file of an article from the Equine Veterinary Journal by Dr. Dyson documenting 199 scans of equine feet. The file name will be EVJ07_39_340_343.pdf. Sue obtained a Fellowship of the Royal College of Veterinary Surgeons (RCVS) for her thesis on shoulder lameness in the horse. She holds the RCVS Diploma in Equine Surgery (Orthopaedics) and is a recognized Specialist of the RCVS. She obtained a PhD from the University of Helsinki for a thesis on lameness diagnosis. Sue Dyson is co-author of the textbook Diagnosis and Management of Lameness in the Horse and a consulting editor to Hoofcare and Lameness Journal. Her newest article is on the subtleties of identifying multiple limb lameness in horses. Sue is a past President of the British Equine Veterinary Association. She has also ridden at top national level in both eventing and show jumping and has produced horses that have subsequently competed at the Olympics and World Championships. Any opportunity to hear her speak is a gift. See you there. Here's a little slide show of moments at Les Quatre Ecoles d'Equestre performance in Paris last week. For the first time, four great schools of horsemanship Lisbon (Lusitanos), Jerez (Andalusians), Vienna (Lippizaners) and France's Cadre Noir performed together and demonstrated their interpretation of the high school of equestrian art. Here's a page of links on Google Video to clips taken by spectators. site_description: Writings concerning equine lameness, horse hoof and foot problems, veterinary and farriery science, laminitis, farriers and the horse industry by Fran Jurga, editor and publisher of Hoofcare and Lameness, The Journal of Equine Foot Science.© Fran Jurga and Hoofcare Publishing. No use without permission. You only need to ask. I am posting a research brief from Dr. Pollitt that should be of interest to every reader of Hoofcare & Lameness Journal. I think a brumby's hoof data would make a great Christmas present! Above: Australian feral horses ("brumbies") photographed from the air by Dr Pollitt in July of 2007 while conducting preliminary research. Australian Hoof Research Project Brief: Determining the range of the Australian wild horse (Brumby) and the relationship to foot type and conformation. Our team has spent much of the past 12 months investigating the use of GPS technology to track the movements of horses. As a result we have developed the ideal tool to track the day-to-day movements of horses in both the domestic and wild environments. Our GPS tracking units allow us to accurately pinpoint the location, speed and altitude of the horse at one-second intervals for up to one week or at 30-second intervals for up to six months. 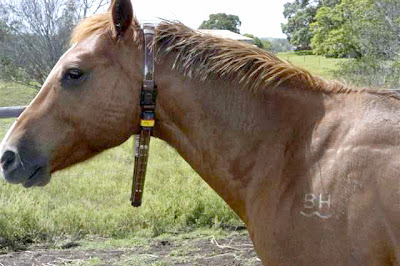 Domestic horse wearing a collar with GPS tracker attached. A GPS unit attached to a strap around the horse's neck is able to fix the position of the horse by aligning its position with at least six satellites orbiting overhead and storing the data on board. 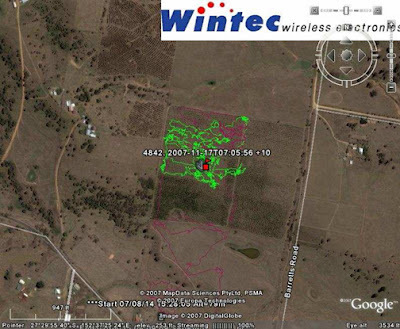 When data is retrieved, it is interfaced with Google Earth to 1) produce an aerial photograph of the horse's movements (see photo) and 2) be overlaid on a geographical mapping system which applies the data to soil and vegetation type, use of water points and topography type. This exciting technology is being applied to horses for the first time by our research team, with the goal of establishing a complete picture of the movements of horses, both domestic and wild, and how they interact with their environment. 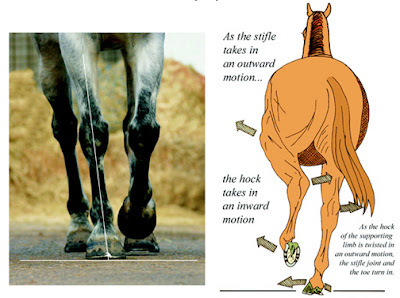 The effect of movement and environment on the horse’s foot is a significant focus of the research. We know from preliminary work that the typical domestic horse’s foot travels very little (approximately 7 km daily) in comparison to its wild counterpart which may travel up to 50 km or more in a single walk. We have several populations of "Brumbies" (Australian feral horses) under investigation to determine natural foot structure and function under various environmental conditions. 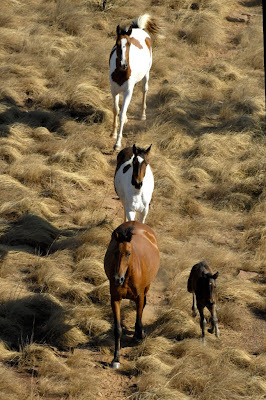 We are about to embark on the most exciting part of the research: to track the wild horses. Brumbies will be darted silently from a hide with a tranquilizer, giving the team two minutes to photograph feet, place permanent markers to determine hoof wall growth rates and attach the GPS collar (see photo). On reversal of the tranquilizer, the horse will rejoin its family band unaware of the intervention. The same horse will be recaptured using the dart gun at the end of the trial to retrieve equipment and then released back to the wild. This work will begin in March 2008 and continue for 12 months in locations in Central and Northern Queensland and the Northern Territory and Eastern Kimberly region of Western Australia. The project will ultimately identify the relationship between a horse’s movement and the effect on foot conformation, structure and function. Our goal is to make well-informed recommendations of the ideal conditions to keep domestic horses to improve the well-being of their feet. You can help in this groundbreaking research. The more GPS units we can attach to wild horses, the better and more accurate the data set will be. 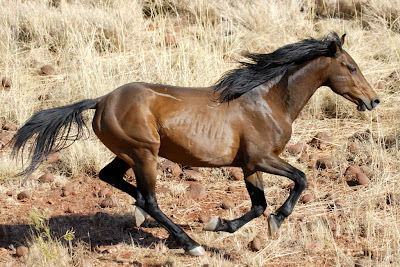 For AUS$3000 (approx $2,600 US) you can own and name a wild horse for the 4 to 6 month tracking season. We will supply photos and location data at the time of GPS attachment and, when retrieved, we will use the GPS download from your horse to generate a report using Google Earth maps. Ultimately, the combined data from all the horses will be compiled into freely available scientific reports. Note: To learn more about Dr. Pollitt and his observations of brumby feet, refer to "The Natural Hoof Down Under" in Hoofcare and Lameness Issue #69. He has also been a keen observer of zebra feet in the wild. Double-click on any photo to view it in an enlarged size but please remember that these photos are the property of Dr. Pollitt and are protected by the copyright of Hoofcare and Lameness Journal and www.hoofcare.com, to say nothing of Dr. Pollitt's six satellites circling the earth. A new study published in the journal Equine and Comparative Exercise Physiology sheds some light on perhaps why I get so confused when I watch the western pleasure classes at the Quarter Horse Congress. Our friend Molly Nicodemus PhD, formerly of the McPhail Center at Michigan State College of Veterinary Medicine and now at Mississippi State, and J.E. Booker of Auburn University analyzed a group of western pleasure horses at the jog and lope. While the paper contains a lot of information, it requires a bit of reading between the lines. It tells you what a western pleasure horse (if the horses tested are typical) does but without comparing it to what other "normal" horses do. Gait analysis has shown pretty reliably that the trot is a two-beat leaping gait and the canter is a three-beat leaping gait. Does the new research mean that the jog and lope are variations of the walk? The American Quarter Horse Association (AQHA), which also defines the jog as a "smooth, ground-covering two-beat diagonal gait", recently changed the judging standards for western pleasure classes: "The horse (in the jog) works from one pair of diagonals to the other pair. The jog should be square, balanced and with straight, forward movement of the feet. Horses walking with their back feet and trotting in the front are not considered performing the required gait." Also from the AQHA: "The lope is an easy, rhythmical three-beat gait....Horses traveling at a four-beat gait are not considered to be performing at a proper lope." The AQHA obviously believes that corrrectly-performing Western Pleasure horses are exhibiting aerial gaits; Molly Nicodemus' paper documents that the horses she tested are not in compliance with AQHA standards. Not too many years ago, Hilary Clayton's gait analysis showed that medal-winning FEI dressage horses were not performing movements as prescribed in the stone tablets of dressage judging standards. 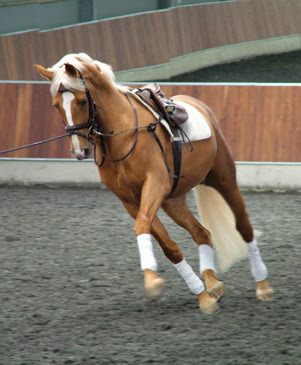 The canter pirouette, in particular, and the piaffe were found to be quite different than believed. Maybe it is western pleasure's time to "move forward" and see their gaits with new eyes. Go to most recent story on the Hoof Blog and read all news. Dr. Hilary Clayton will lecture on the nature of footing, in all its depths and shapes and surfaces, at the United States Dressage Federation Convention this week in Orlando, Florida at the Disney Coronado Resort. Hilary will speak on Friday, November 30, both in the morning and again in the afternoon. The title of the lecture is "Impact of Arena Footing on Soundness". The USDF convention has an extensive program on horse health, and lameness in particular, this year. Next week, Dr. Clayton will lecture on her latest research on the temporomandibular joint, reporting on how horses chew hay and pellets. That lecture will be on Wednesday, December 5 at 11:05 a.m. as part of a seminar on dentistry at the American Association of Equine Practitioners Convention, also in Orlando, but at the Orange County Convention Center. Watch for a new book and dvd set coming soon from Dr. Clayton, who is the Mary Anne McPhail Dressage Chair in Equine Sports Medicine at Michigan State University's College of Veterinary Medicine and a key contributing editor to Hoofcare and Lameness Journal. If you are attending either the USDF or AAEP conventions (or both), say hello to your faithful blogger! In the photo: Palamino warmblood stallion Treliver Decanter from Treliver Stud in Buckinghamshire, England makes good use of his arena's footing. Some horses in Massachusetts have had to allow a stranger to pick up their hooves lately. Forgive them if they're restless; some of these horses have never even known another farrier. That will be the case today when a Dutch Warmblood named Iabony lifts his big feet for Tom Maker, who'll be helping out a friend. Allen Smith normally shoes for a very select client list; his list hasn't changed much over the years. But right now, Allen is recovering from cataract surgery and a detached retina, so Tom and some other farriers are lending their able hands for an old friend. 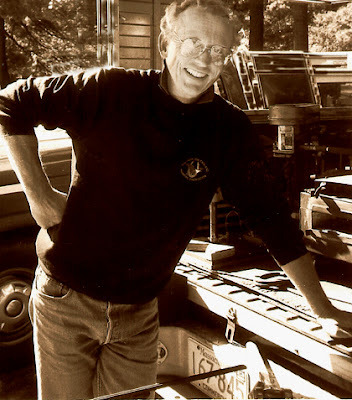 Allen is known, of course, as the former president of the American Farrier's Association and its de facto ombudsman. But he really does shoe horses when he's not quoting Roberts Rules of Order. The AFA has always depended on Allen to see things clearly and he hopefully will be doing that again very soon. Author David Gill contends that the normal supporting limb (during the progression of the stride) is positioned at an angle of around 84 to 86 degrees, rather than directly perpendicular to the ground as often portrayed in diagrams. Therefore, he writes, lateral heel landing should be considered normal. Hoofcare and Lameness Journal is the exclusive US source for the new book Farriery: The Whole Horse Approach by British farrier David Gill. The first copies have arrived and already found their way into the hands of eager readers. And the discussions are beginning! This is the first book to truly focus on grazing stance, shoulder angle, chest width, back pain, “handedness”, crookedness, etc. 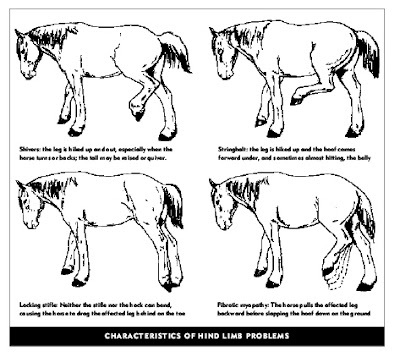 and their effect on horses with mismatched feet and/or limb deformities and gait asymmetries. It redefines evaluating the foot as an indication of the horse’s development and athleticism, both normal and abnormal. And it suggests that "normal" may not look like what we have been studying in textbooks all these years. This is the most in-depth treatise on imbalance in the modern horse that has been written. The author perceives the hoof as the dynamic structure that is the great equalizer (or victim, in some cases) of asymmetric weightbearing, gait and conformational challenges from above, and suggests how to recognize problems that can be corrected and compensate for those that cannot. Chapters: Anatomy (40 pages), Hoof Balance Revealed, Anterioposterior Balance, "Odd But Normal" Hooves, Mediolateral Hoof Balance, The Crooked Horse, Farriery in Practice. From a subscriber who bought one of the first copies: "The book I bought from you at the meeting (Farriery: The Whole Horse Concept by Gill) is a very good book and I'm reading it cover-to-cover. It is very succinct and the illustrations are excellent. References cited in the book are current and reflect the author's obvious study of leading edge research." The illustrations are excellent. Whether you agree with the author or not, you will admit that this book diagrams functional hoof anatomy at a level not available to us before. As with our other new book, Hoof Problems by Rob Van Nassau, I wish the illustrations were available in a cd-rom archive for educators (and journal editors). Postage: USA $6, Overseas $15; actual cost will vary by country and may not be insurable. Click here for a faxable/mailable order form. Click here to visit our web page on this book. You may order by phone (01 978 281 3222), by fax (01 978 283 8775); by email (books@hoofcare.com) or by mail (Hoofcare & Lameness Journal, 19 Harbor Loop, Gloucester MA 01930 USA). Visa and MasterCard accepted. The author is meticulous about the fresh specimen prepared for his photos. He used mostly white feet. All the photos of cadaver limbs are identified as such, and all photos of limbs have been vignetted so there is no distracting background except when living horses are shown. This photo of the laminae making their hairpin turn at the heel is coupled with a photo of a corn seen from the solar surface. The foot surface of the German Duplo shoe. Something else to be thankful for this Thanksgiving weekend: clever people keep trying to build a better horseshoe so I always have fodder for articles. I think mousetraps are over-rated. The horseshoe is certainly the world's great design-improvement challenge. The latest new shoe concept to catch my eye is the "Duplo" shoe, a fine example of German engineering, and the latest entry in the 3-D horseshoe design challenge. Before I even looked at this shoe, I was sidetracked by the sizing system. They make two models: round and oval, which roughly translate to front and hind. And each shape comes in 13 different sizes...and the company apologizes for not having shoes big enough for some warmbloods and draft horses. The choices don't stop there: the 26 sizes are available in three hardnesses. (I can see some of the farrier suppliers starting to twitch now.) So now we are up to 78 possible configurations of this shoe. There are also winter models and closed therapeutic models, so I think that must take them well over 100 models and sizes. Another interesting thing is that this is a plastic shoe with a metal insert for stability. 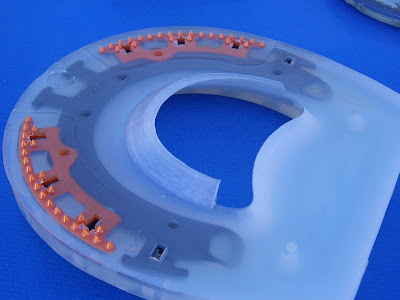 The horseshoe is made of soft plastic, which is cast around a plate of laser-cut sheet-metal. This metal insert provides purchase for the nail heads. This view shows the height of the teeth that grip the wall. This is the foot surface of the shoe. But the piece de resistance of out-of-the-box thinking is that there are no clips. Instead, the profile is textured or "studded" on the foot surface to prevent slippage. Any "studs" (more like teeth) close to the sole can be ground down. The thicker the hoof wall, the more rows of studs (teeth) you'd leave in the shoe. And the manufacturer says that the nail holes are "punched" perpendicular to the white line. I've read the literature about the shoe but I'm still foggy on this one. (Do the nails come back out?) There's also an inverse inner plastic rim. Hubert Frank, the shoe's designer, is a farrier in Germany and he has managed to engineer a shoe that goes where none has gone before. His intriguing horseshoe concept is not a prototype; it is for sale in Germany. I wish him and all the other innovators out there the best of luck. Keep the ideas coming! Note: Hubert's website is: http://www.duplo-frank.de/en/Duplo-Plastic-Horseshoes is in German, French and English.